"Heart on the Floor ft. Dia Frampton" from The Summer Set's new album 'Legendary,' available now at iTunes, Hot Topic, Best Buy and FYE. 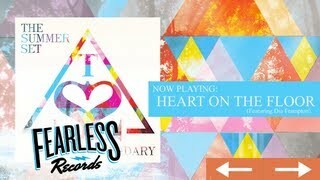 Chords for The Summer Set - Heart on the Floor ft. Dia Frampton (Track 05). Play along with guitar, ukulele or piano using our intuitive playback interface.